Sorry for the absence this week—I’m working on a stealth project so I’ve nothing to show for all of the effort I’ve put in. One thing I did do, though, was play around with a buttonhole idea; I’m not going to be able to include it in the project, which means I don’t have to keep my mouth shut about it! So, vertical buttonholes. There are a dozen different reasons why you might want them rather than the usual yarn over or horizontal ones in handknits. 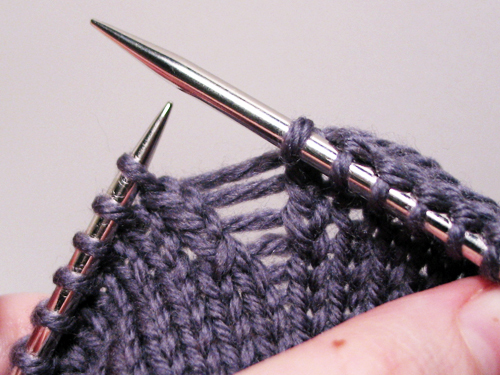 The biggest case for them that I can see is when you actually want your buttonholes to be horizontal, but are working perpendicularly, like when knitting a buttonband onto a sweater. You’d want the buttonholes to be horizontal relative to the sweater because that way, any sideways pulling on the buttons will only pull the buttonholes tighter. 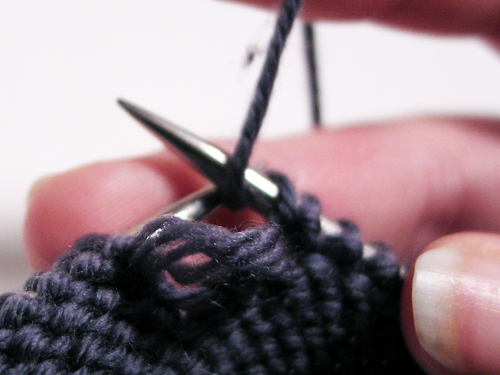 If the buttonholes are vertical in relation to the sweater, then sideways pulling will actually cause the buttonholes to open wider. The problem of course is that there’s no easy way to get a vertical gap in there without working the two sides separately, which is a pain. 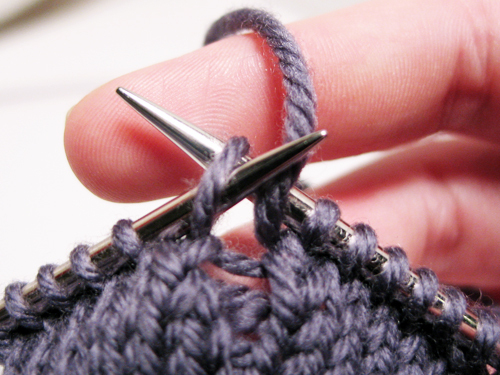 Yarn over buttonholes do work but can be too small for the buttons you’d like to use, and are often prone to stretching out and becoming unstable. 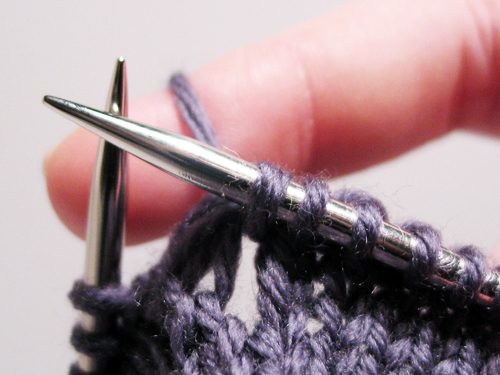 What oh what is a knitter to do? p1 tbl and finish the row as normal. k1 tbl, and finish the row again. This is the point where you’re probably looking at me like I’m crazy and wondering how the heck all the ladders you’ve just made could possibly turn into a buttonhole, let alone a good looking one. I promise it’ll all work out in just a few seconds! Back on the wrong side again, you’re going to work in the same manner, purling the stitches on either side through the back loop and dropping the yarn over, only this time, don’t make a new yarn over—this helps keep the buttonhole from getting floppy. 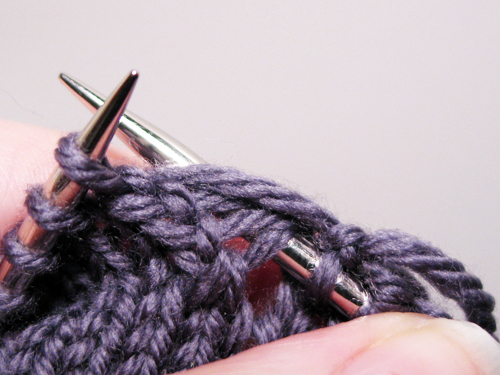 And draw the new stitch out through the front, so that you’ve picked it up from the strands. Simple, easy, nice and neat buttonhole! THAT is very cool and ingenious! I may have to incorporate this into a sweater sometime. Thanks for the tutorial! That is genius! Correction: YOU are a genius! Very nice, and totally makes sense the way you describe it. Thanks for sharing that! Brilliant! I will totally be using that. INSTABLE? Shouldn’t that be unstable? Or are you knitting among the horses in their stalls? Thanks for sharing that and photographing it so beautifully! I agree — your technique is brilliant! That is awesome! Thank you for sharing. How I love your tutorials! Really nicely explained! Thankyou for the tutorial, it’s very clear and the technique works a charm! You just saved my Teapot Mitten from being a poorly fitting one (will put it on Ravelry as soon as I have a chance). I have to tell you, finding you was a total blind accident! 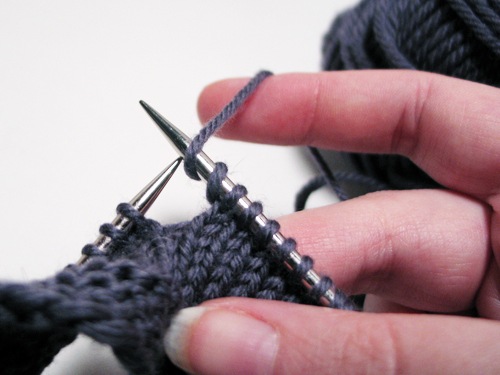 I am currently finishing up a test knit for a very good friend. She has designed 2 outfits and we have scratched our heads more than once on this type of BH. I told her this morning that I would dearly love to dispense with all the folderol around having to break the yarn and knit 2 sides separately just for 1 BH. I said that unless some miracle happens and a solution is dropped into my lap, I’ll have to do that. At the last minute she googled but I never saw what and she never said. Minutes later I get this tutorial! I wrote right back to her: “It’s a miracle!” I was so shocked at seeing this that I immediately bookmarked you. Thank you for making my life so much easier. I hate BHs but thanks to you, they are much better to swallow. Just founds a new website selling Clothing Buttons. I have been buying buttons for years and have never found and easier website to use! and I would say the best prices too, check them out! Great tutorial. What size button do the instructions accommodate and how do I adapt to 2-1/4 inch button on 5st per inch gauge? Thanks. Came across your post and found the perfect solution to something I’m designing…thank you so so so so much! Thank you, Jesh! You saved the cardigan I’m just finishing for my darlin’. May the Force be with you! I would appreciate having an email address so I could ask a few Q’s…..like…tbl should have been defined…sometimes I didn’t know if it was a double yarn over. Or single? Mine came out ‘ok’ , but left a loose spot on the left section of the RS. Email , or contact info, please? 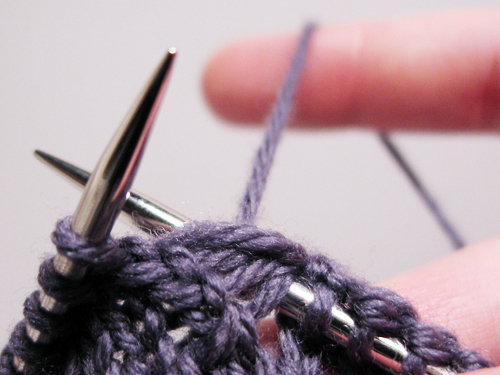 Parts of this tutorial are excellent, and I am glad to have a method wherebyI don’t have to cut yarn…I hope you will reply. Lerwin2@me.com. Thank you! Thank you for this! Not sure why so many cardigan patterns now don’t include buttons, so now I am forging my own way. Ugh. Curious how this changes with button size. I am planning on 1 1/4- 1 /3/8 buttons on Aran/chunky weight yarn, Fishermans rib button band (Buckley pattern). Still the same count? Anything I need to alter for the ribbing? 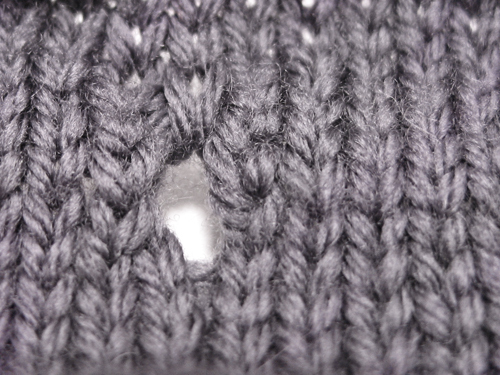 Also, when you say you need three stitches for the hole, do you want the middle one to be the center to line up to where the button will be attached? You want my etsy shop! jesh.etsy.com for all your handmade drop spindling needs.